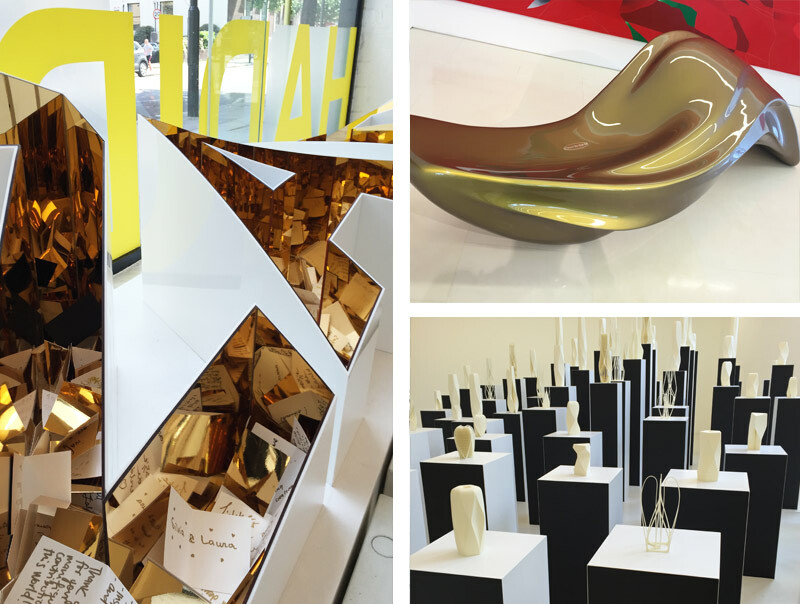 Discover all the best design on show and our stand out moments. Clerkenwell Design Week is situated in London’s trendy borough of Islington and spread across a number of different venues. A highlight in the design lover’s calendar for 7 years now, the British spectacular is made up of installations, showroom events and exhibitions. This was the must see installation and the hub of the whole event. 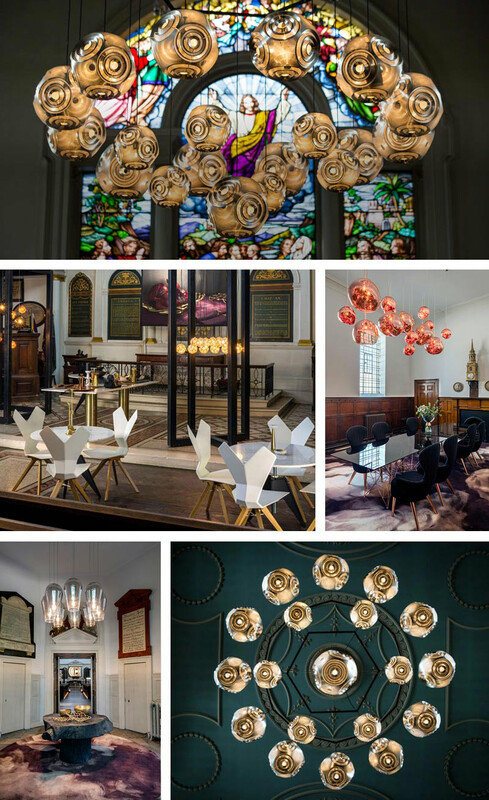 The Church was a design collaboration between Tom Dixon and the Vicar of St James’, a 17th century church situated on Clerkenwell Green. 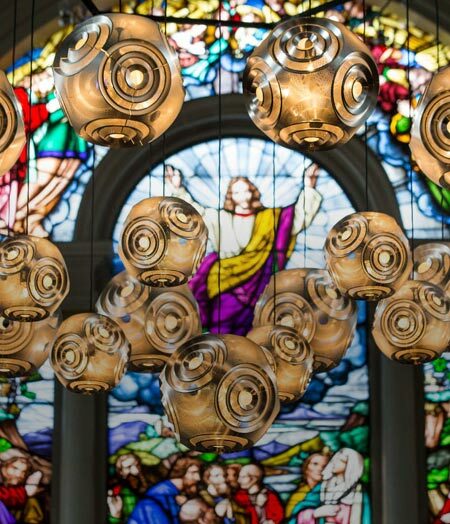 The process involved installing a large central chandelier in the main space, a co-working environment and a kitchen, all as permanent fixtures and Tom Dixon inspired design fans with a talk about the design process. Source: Tom Dixon 1. Tom Dixon Curve Ball Pendant Light, Tom Dixon Melt Collection & Tom Dixon Fade Pendant Light. A scaled down version of Vitra’s Milan showcase, a combination of new products and old was presented to celebrate the complete Vitra home collection. Focusing on the textile and colour elements of design with each coloured zone inviting you to either Relax, Refresh, Read, Connect or Meet. 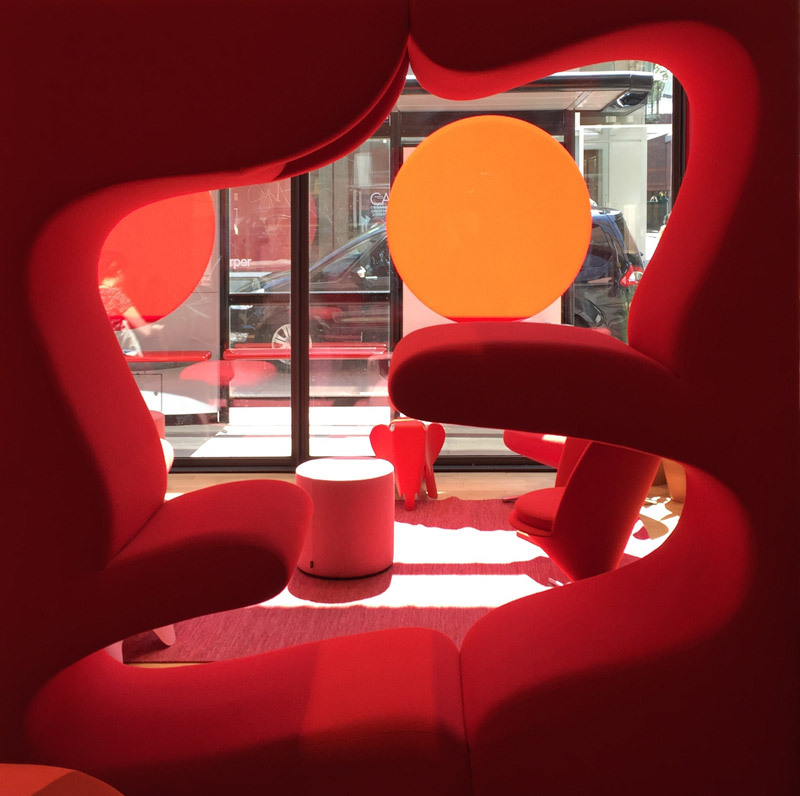 A highlight was the Living Tower by Verner Panton in the Red Zone which was particularly interesting and thought provoking. It can be used on four different levels for seating, resting or as a piece of visual art. The Vitra Hack Desk was another impressive part of the Vitra display. The hand crank mechanism makes it easy to adjust the working height of the table in seconds, making it a versatile piece that can easily be adapted to suit a number of different surroundings. 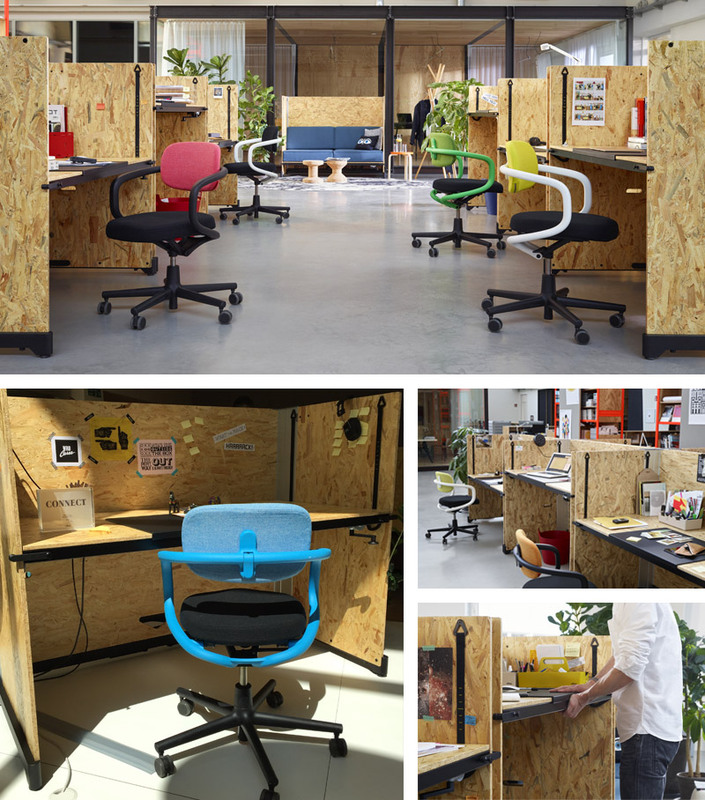 It looks great paired with the Allstar Office Chair and makes an ideal collaborative working space. 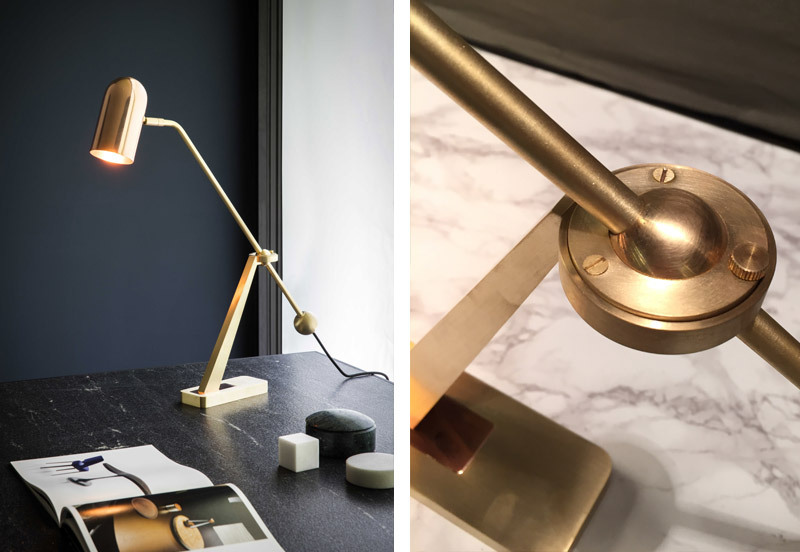 There was a huge emphasis on materials brass and oak with the Stasis Table Lamp from British design house Bert Frank stealing the show with its brass finish and unique ball joint movement. The impressive oak frame of the Massproductions Icha Icha Writing Desk is compact making it perfect for your home. 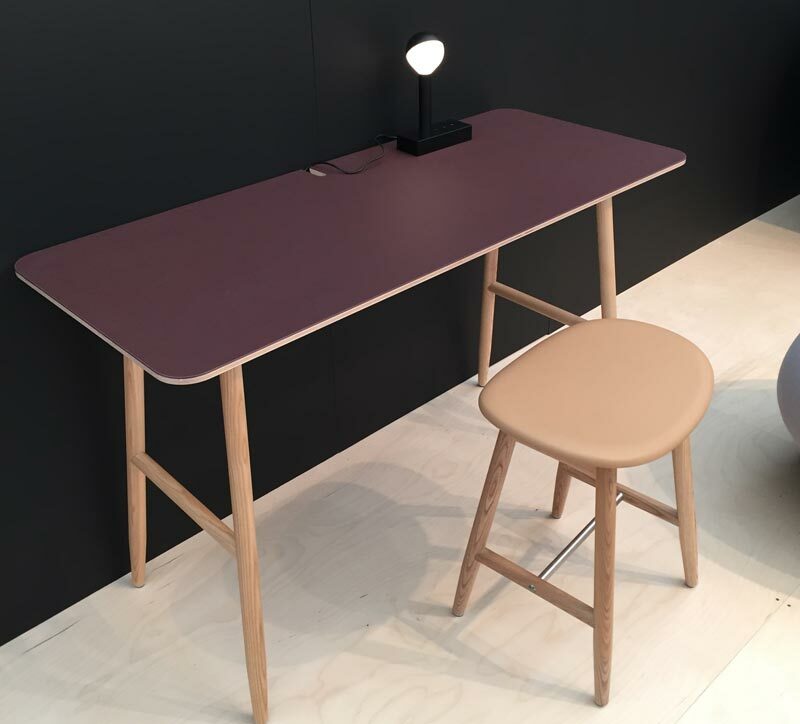 Shown with a combination of an oak frame with an aubergine coloured linoleum table top, its compact size makes it the ideal piece for areas where there’s a lack of space. There were a range of exciting new product launches at Clerkenwell, with Resident unveiling their new range of furniture at the famous Fabric nightclub. The clubbing hotspot was turned into the Icon House of Culture showcasing a number of impressive designs with Resident’s new pieces all designed around the theme of adding value to the places in which we live, work and play. 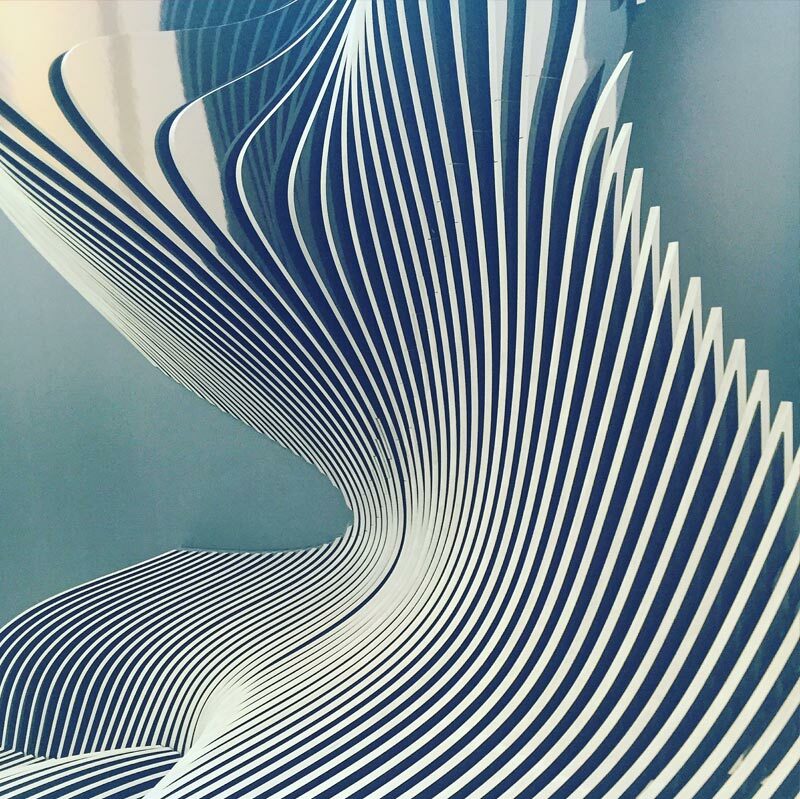 And at last but not least, a major highlight of Clerkenwell for us was visiting the Zaha Hadid Design Gallery where there was an amazing snapshot of her impressive design legacy on show, a must see if you’re heading to the area. Highlights from the Zaha Hadid Design Gallery including, architectural models created through Parametricism - City of Towers. A number of these impressive new products and designs from the Clerkenwell Design Week are available at nest.co.uk, or will be available in the near future, keep checking the nest.co.uk website for further details. Got something to ask? Get in touch with our friendly team by emailing info@nest.co.uk, calling 0114 243 3000 or messaging us on Live Chat. Welcome to our hub of interior ideas, good design and favourite things we think you should know about. Delve into our philosophy of forever design and get the dose of inspiration you need to help find your style and create a timeless home that truly works.